The St. John Bosco Braves improved to 9-0 on the year and continued their quest for a national championship with a 49-14 rout of Santa Margarita on Friday. 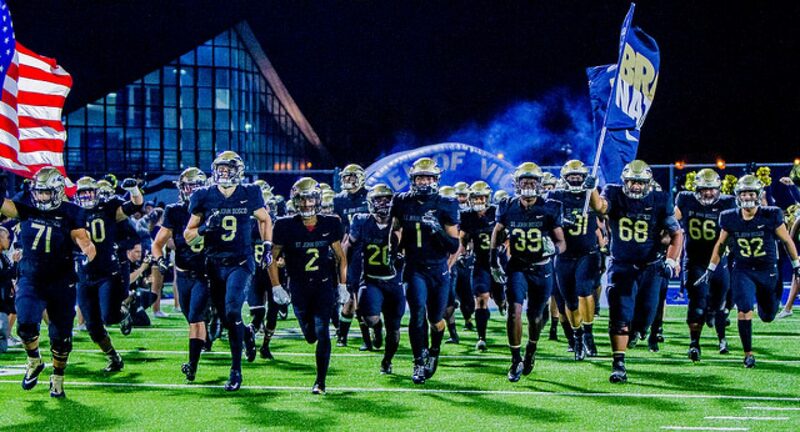 Coming off an emotional victory last week against Mater Dei, St. John Bosco showed no signs of a hangover and kept their foot on the gas, defeating Santa Margarita easily. Quarterback DJ Uiagalelei continued his unreal season, going 10 for 13 from the field and throwing for 255 yards and two touchdowns, only playing roughly a half of the game as well. Senior wide receiver Colby Bowman had a solid game as well, catching just three passes but taking them for a total of 142 yards and a touchdown. Running back George Holani also added two touchdowns, rushing and catching one of each. Holani – a Boise State commit – continued his unbelievable season, amassing 94 yards on just nine total touches. The game begin with Uiagalelei rushing for a one-yard touchdown to give the Braves a quick 7-0 lead. Santa Margarita quickly responded with a touchdown drive of their own, but this marked the last time this game would be close. The Braves scored 42 straight unanswered points, putting them up 49-7 at one point in the fourth quarter. The Braves continue to show out as the best team in America for high school football and will take on the Service Friars next week at Panish Family Stadium in their final league and homecoming game.